President Akufo-Addo has been applauded by the Chief of Sankore in the Ahafo Region, Nana Ogyedom Appiah Kubi Pabo Katakye IV, for visiting the area by road. The chief’s sarcastic remark comes against the backdrop of former President John Mahama making such trips by air during his tenure. It would be recalled that in the dying months of the previous administration, the head of state told then presidential candidate of the New Patriotic Party (NPP) Nana Akufo-Addo that he was not appreciating the good roads constructed in the country because he was always sleeping on his trips. The chief made the remarks during a durbar held in honour of the President as part of his two-day tour of the Ahafo Region which ended on Saturday. “The chiefs and people of Sankore are solidly behind you in whatever you will do to ensure progress and development for Ghana. Pay no heed to petty gossip. It takes courage to run a government, and you have it. Sankore is behind you,” he added. He also expressed gratitude to the President for creating the region he and his people have demanded for many years. “We said we wanted our own region, we had knocked on all doors, sent petitions to wherever it is required, way before I was born. But when the President came, he checked the books and agreed with us that indeed we need our own region. Only Akufo-Addo will do this for us. We are grateful,” he added. The chief bemoaned the terrible state of roads in that part of the country, which is known for cocoa production. 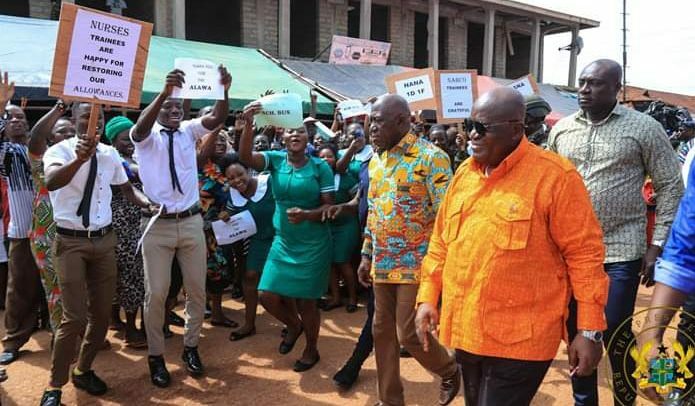 President Akufo-Addo said the cycle of politically related violence and vigilantism in Sankore in the Asunafo South Constituency of the Ahafo Region would soon end. His assurance is steeped in the current introduction of Vigilantism and Related Offences Bill to Parliament, which when passed, would effectively deal with those flouting the law across the country. The President presented eight vehicles to the Ahafo Regional Coordinating Council during the two-day tour of the newly created region. He also cut the sod for the construction of the Regional Coordinating Council building. President Akufo-Addo also inspected a bricks and tile factory under the ‘One District, One Factory’ programme at Tanoso in the Tano North District. The factory, Rhovanni Royal Limited, would employ about 1,800 youth from the area and has the capacity to produce 125 tons of clay products per day. The Chief Executive Officer of the company, Carl Loko, briefed the President on the progress of work so far and assured him that production would begin in November.